Soelden, situated in the famous “Oetztal”, is a truly unique winter resort. More than 150 km (93 miles) of slopes and state-of-the-art lifts and gondolas await you. Have you every spent a night in an igloo? An unforgettable night at the Soelden Snow Village at 2700 m/8859 ft. is guaranteed. Soelden is also an attractive resort in summer: Friends of adventure and fun sports as well as hikers find their way to Soelden to breathe the fresh mountain air. 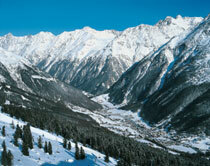 For vacationers seeking relaxation, Soelden’s magnificent countryside can fulfill this wish as well. Pretty flowery meadows and grazing deer invite you to discover the beautiful landscape. Visit Soelden and enjoy the various opportunities. 150 km (93 miles) slopes provide an ultimate ski fun. The ski areas “Soelden”, “Hochsoelden”, “Giggijoch”, “Gaislachkogl” and glaciers connect to one big ski area. While beginners prefer the easier slopes at “Hochsoelden/Giggijoch” including a snowboard-funpark with halfpipes, jumps, boxes and rails, the expert racers find off-piste skiing at “Gaislachkogl”. The peak of Gaislachkogl is at 3058 m / 10033 ft.
From November until May, snow is guaranteed at the two glacier ski areas “Rettenbach” and “Tiefenbach”. Soelden is Austria’s only ski region with 3 mountains higher than 3000 m / 9843 ft, that are accessible by gondolas (Big 3). If you are in shape, try to ski all 3 peaks in a day and cover 50 km / 31 miles and 10000 m/33000 ft of elevation change. In between the runs, stop at one of the many ski huts and restaurants within the ski area for a break. After so much skiing, make sure not to be too tired to enjoy Soelden’s night life with over 45 lively après ski-bars and discos. Adventure and fun sports seekers find their kick in Sölden: wildwater rafting, canyoning, paragliding, skate and fun parks are some of the possibilities. If you like to have lunch at 3041 m/9977 ft., take the largest double cable gondola up to Gaislachkogl and enjoy a breathtaking view. Mountain Bikers will find signposted mountain bike routes, special mountain bike hotels and local buses. There are various hiking paths around Soelden. From Monday to Thursday, there are even guided walks and hikes, organized by the Oetztal Arena Tourist Board free-of-charge. You just have to register one day in advance. The “Granaten Yeti”, a dedicated collector of minerals, exhibits his finds in the “Berghof Silbertal”. On Mondays, there is also the possibility to buy pieces and meet “Granaten Yeti” personally. Water fun, sports facilities and relaxation await your in Soelden’s “Freizeitarena”. If the weather is bad and you like to soak in an herb bath or feel like playing some tennis or badminton: visit this multifunctional sport center. Relax in the 40 degree Celsius (104 degree Fahrenheit) warm water in the Aqua Dome Laengenfeld. The water comes from a depth of 1865 m/6119 ft. – a sulphur thermal spring. Relax and get ready for a new day. There is also a children’s area (designed in the shape of a ship) to make sure, that kids have their fun too. Spend a night in one of eight igloos at Austria’s first “Igloo Village”. This snow village is located in the heart of the “Rettenbach” glacier, at an elevation of 2700 m/8859 ft.! Six igloos for 4 persons and 2 private igloos for 2 persons each promise a special experience. Think back to the time when you built an igloo as a kid. Do it again and learn properly about igloo building techniques with a certified guide. About 15 min from Soelden, the “Oetztal Museum”, housed in a 300 year old farm, shows the way people lived in the past. A collection of tools was witness of the farming and working world a long time ago. Soelden is located in the western part of Austria, in the “Oetztal” (Oetzvalley). The closest airport is in Innsbruck, 85 km/53 miles away (1 hour by car). Soelden is reached in 3 hours from Salzburg or Munich and in 3.5 hrs from Zurich. There is also the possibility to take the train until “Oetztal Station” and then board the public bus to Soelden.